You've seen more than a few of Vardenchi's spectacular choppers on these pages. But when we made the call, we didn't really know what we wanted. So we took the easy route out. With that rather vague design brief, the ever-ready Vardenchi machine was set into motion to create BSM's special. Having seen first-hand our love for sporty machines, Akshai knew from the start that a long, low and heavy chopper sort of thing wasn't on. 'Come on, a BSM chopper? That would be the day.' So it took a different path. 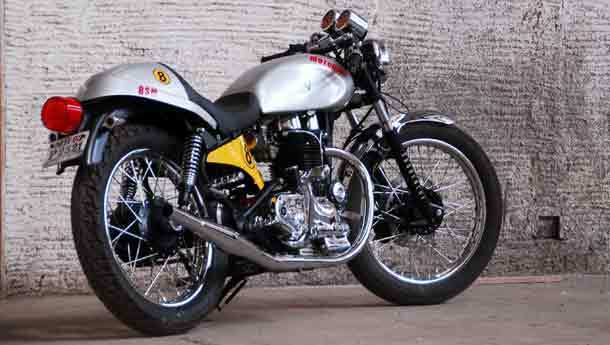 Having surfed a whole bunch of Brit Bike sites, Akshai decided to re-interpret a Cafe Racer for the special. Of course, he didn't tell us this until later. But obviously, having built the ThunderClap, that would have worried us. Repetition, at BSM? Can you even imagine that? Walking around the machine, we noted a fairly complex looking front brake. 'Oh, that's actually an Avenger brake that we adapted to the bike. It really works very well.' Oh? Why not a regular Bullet disc then? 'Er... We got a bit lazy. We had the Avenger bit lying in a box on the shelf, and we would have had to go out and buy a Bullet disc...' Ah so. Till this point, no one at BSM had actually seen anything of the bikes. Every time we asked Akshai Varde to send us pics from the in-progress build, he said, 'Ya, no problem. I'll send them soon, okay?' And then promptly forgot about that. So when he rolled in with the silver-and-yellow beauty, we were faced with two tasks. One, stop staring at the gorgeous custom. And two, we needed to christen it. And of course, we immediately did neither and took it out for a spin instead. Aye, it's lovely. Thumping around all over the place, the latest BSM Special is a supremely comfortable motorcycle. Where ThunderClap gave us a few aches and pains, the Vardenchi ThunderStrike will allow you to stay in the saddle for as long as you like. Yup, ThunderStrike.